Industry is working very closely with the Department of Computing & Mathematics to shape the third level curriculum and to ensure a stable pipeline of graduates to fill the over 7,000 vacancies in computing roles in Ireland. This has led to computing graduates regularly achieving top salaries starting out in their new careers. The Work Placement Programme for Computing students at WIT is an integral, accredited module for all of our third year undergraduate students. Work Placement gives students the opportunity to apply the theory they’ve acquired on their degree programme to real-world problems and tasks, in an industry setting. It also enables third level institutions to interface more effectively with industry partners and to build relationships with companies in the region and nationally. Work placement has many benefits for students, employers and WIT. The overall benefit to students is the opportunity to integrate theory and practise in their chosen field by bringing their classroom learning into the real world. Their employability is increased by the need to focus on personal transferable skills, such as teamwork, self-motivation, analytical skills, communication, problem solving and taking criticism and direction. Students will often develop greater self-confidence and self-awareness as a result of their experiences. The time spent in the workplace may cement their career aspirations and bring about a new sense of ambition, commitment and purpose and provides an enhanced understanding of the practicalities of the work environment. Provides the opportunity to put course theory into practice. Chance to learn new knowledge and skills, both course-related and personal. Gives an insight into working life, develops self-awareness and supports students in making career decisions. It also helps students to become more confident in their skills and abilities and how they can contribute to an organisation. Development of the CV, highlighting new skills and achievements and enhances employability and job prospects after graduation. Creates a network of potential contacts for the future. Work placement offers employers the opportunity to assess potential employees before awarding them longer-term contracts which can prove to be a very cost effective recruitment strategy. They can also benefit from the input of fresh ideas and innovations from enthusiastic and motivated students. For some employers, it is an opportunity to address short-term company needs such as covering staff leave, helping out at busy periods or undertaking projects for which no-one else has the time within the business. Students offer a source of skilled labour and an insight into new practices being taught in HEIs and can bring new ideas and perspectives into the workplace. 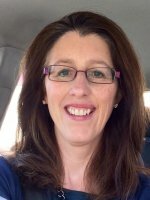 They can provide a flexible and cost-effective solution to recruitment needs and help ease staff workload at busy times. Employers can identify potential new recruits for future graduate recruitment, by giving them the opportunity to assess potential employees before awarding them longer-term contracts. It develops links with HEIs for a range of purposes, such as R&D. Work placement gives our lecturers and programme directors opportunities to foster links with industry and to understand the views, business drivers and changing education requirements of industry, thus informing the course content of programmes. This is particularly important for our department as the Computing/IT industry is constantly evolving. Resulting relationships can lead to collaboration with industry for staff R&D and students’ final year projects and increased student engagement with and understanding of course theory, having seen first-hand the application of theory by industry. The recruitment procedure at WIT is flexible and open to the needs of individual employers. 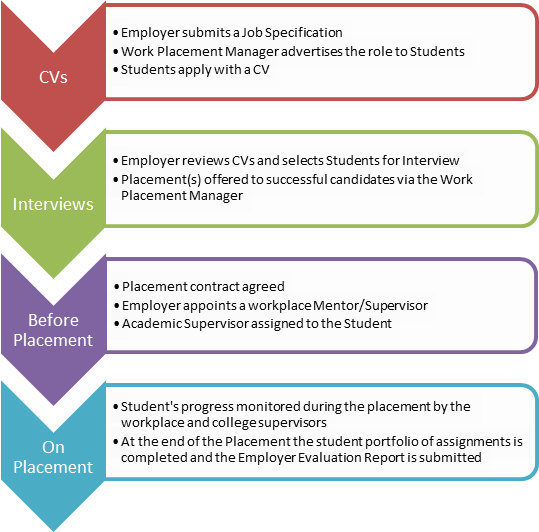 In most cases, the Placement Manager advertises a job specification for the placement role internally to the students, with an indication of the skills required, etc. Students apply for the role by submitting a CV and these are then sent to the employer for review. If students are shortlisted for interview, the Interview sessions can be held either at the WIT campus or the employer's premises.